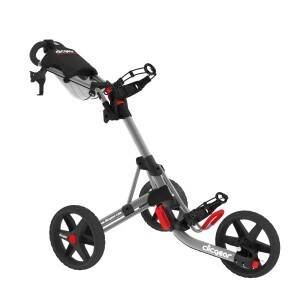 Home › Golf Bag Reviews › What’s the Best Golf Push Cart? What’s the Best Golf Push Cart? Want to walk, but tired of carrying your own bag? Why not try using a push cart! Like many other golf products, push carts have made a lot of advances over the years. They are now lighter, stronger, easier to push, easier to load, and can fold up with the flip of a switch. They also feature advanced braking systems, and have holders for everything you can imagine (umbrella, score card, golf ball, drink, pencil, etc.). We recently looked at the best cart bags available, so here is our look at some of the best golf push carts on the market. Clicgear has become a dominant force in the push cart market over the past few years. They have accomplished this by making the most innovative and technologically advanced push carts available. The Model 3.5+ is an updated version of Clicgear’s well received Model 3.0. It maintains the original 3-wheel design, and includes the following upgrades: 50% larger storage net, larger cup holder, improved strap system to fit all bag sizes, improved umbrella holder, and a better braking system. The Clicgear 3.5+ frame is made of aircraft grade aluminum tubing for unmatched strength, and uses airless tires, so you will never have to worry about getting a flat. The best part of the Clicgear cart is that it folds up into an extremely compact size (13″ x 15″ x 23″), and will fit into any standard car trunk. Other features include scorecard holder, ball holder, pencil holder, and tee holder, independent handle adjustment, and accessory mounts for Clicgear add-ons like this cart seat. 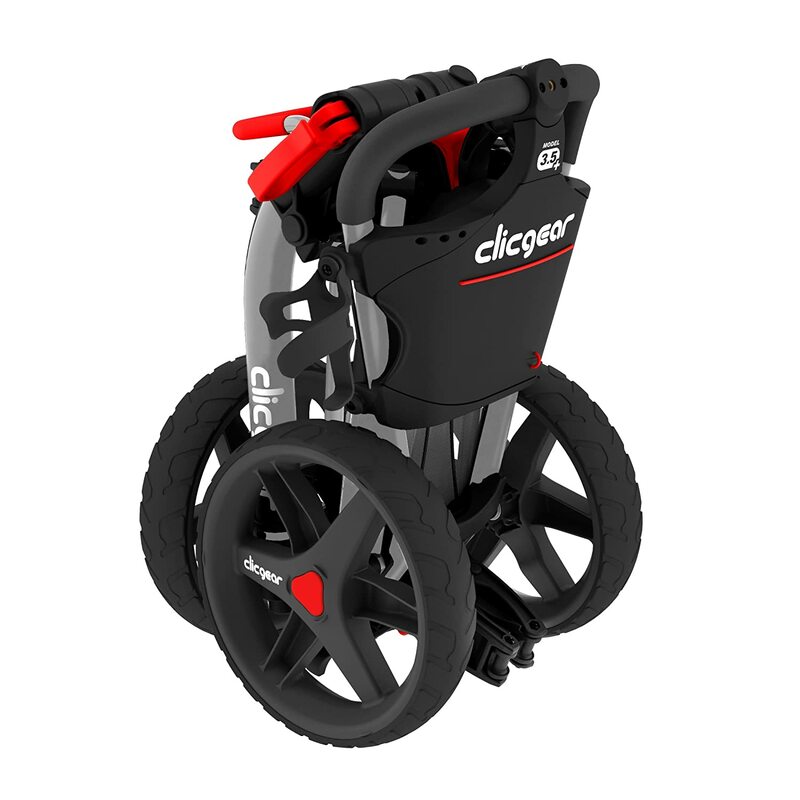 The Clicgear 3.5+ is simply the king of all golf push carts. If you are willing to spend the $250 necessary to obtain this bad boy , then it is our choice for the best golf push cart available. Clicgear’s $250 pricetag a bit too much? 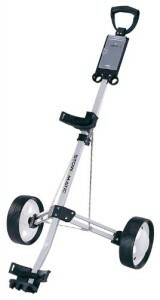 Then, the CaddyTek CaddyLite Push Cart is a great value alternative. For only $112 (on Amazon), you can get many of the same features including advanced braking system, independently adjustable handle, and umbrella holder. The CaddyTek also has a simple folding mechanism, so you can quickly and easily stuff it in your trunk. It does not fold up as compactly (17.5” x 15.75” x 33.6”) as the Clicgear, but should still fit in most standard car trunks as long as you don’t have a lot of other stuff in there. If you want to save a lot of money, and don’t need some of the extra frills or add-ons of the Clicgear, then this CaddyTek push cart is a superb choice. The C3 is another awesome golf push cart from specialists Bag Boy. It is made of lightweight aluminum frame, and is extremely easy to push around the course thanks to its oversized wheels. It folds up super compact in three simple steps for easy storage and transport. The Bag Boy C3 also has convenient compartments/holders for everything you need — smartphone, keys, drink, umbrella, golf balls, scorecard and more. The handle is adjustable to your height, and has a parking brake so you can stop on a hill without having to hold your cart from rolling away. Overall, the C3 is just a fantastic, premium level golf push cart, and is suitably priced at $190. Currently, it is on sale for just $177. Make sure you take advantage of this deal while you still can! Want a no-frills, cheaply priced golf push cart? Then the Stowamatic Lite Trac could be for you. It doesn’t have any fancy features like an umbrella holder, or special storage compartments. 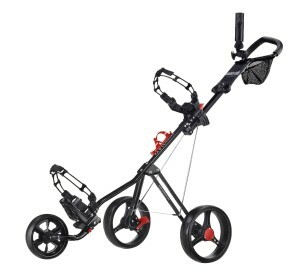 It is just a fanatastic, lightweight, durable, basic golf push cart. With only two wheels, the Stowamatic is the lightest golf push cart on our list, weighing in at about 7 pounds. It will fit any sized golf bag, and features a scorecard/pencil holder, as well as a couple ball holders. The Stowamatic won’t win any awards, but it will get the job done. If you are just looking for a basic, cheap, no-frills golf push cart, then the Stowamatic Lite Trac could be the best golf push cart for you. Currently, the Stowamatic is available for a ridiculously low price of $46.99!!! Don’t be fooled by its looks. This is not a baby stroller. It is just another great golf push cart from CaddyTek. This 4 wheeled push cart is made of a strong, but lightweight aluminum frame, and offers amazing stability compared to traditional 3 wheelers. The extra stability is great if you use an extra large bag, which would often cause smaller push carts to tip over. 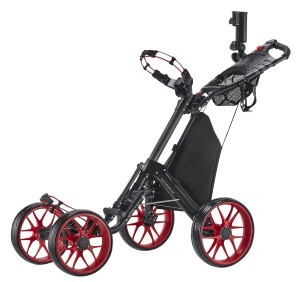 The large wheels (11.5″ rear, 10.5″ front) means you can push this cart over all sorts of terrain without difficulty. The cart also features impressive storage options — basket with built in cooler pocket, mesh net near handle for quick access, umbrella holder and storage rack. 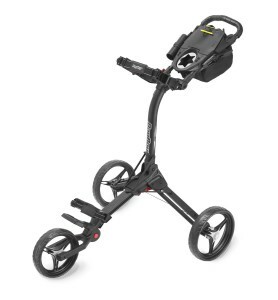 The best part of this push cart from CaddyTek is its patented one-click folding mechanism. With a simple click and push, this large push cart folds up nicely so you can put in your car trunk, or storage. Of couse, this cart will not fold up as compactly as most 3-wheeled push carts. If saving space is a priority, then this may not be your number one choice. However, if you are looking for extra stability and easy maneuverability, then this 4 wheeler from CaddyTek may be the best golf push cart for you. ‹ What’s the Best Golf Cart Bag? You are missing one of the best carts on the market. The Easy Drive by Spin It Golf Products.